Wholesale Trader of a wide range of products which include knitted wire mesh gasket. The Knitted Wire Mesh Gasket product line consists of various forms of metal knitted wire mesh or wire mesh fabricated over an elastomer core thus serving as both an EMI/RFI gasket shield and a limited environmental seal. Knit Shield is commonly used in electronic enclosures where low closure force is required with low compressibility set. 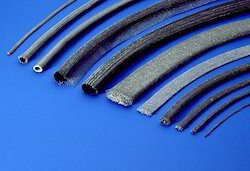 Elastomer core products are typically an economical way to shield large gaps. Standard Knit Shield cross-sections are rectangular, round, round-with-fin, and double-round-with-fin. Looking for Knitted Wire Mesh Gasket ?